In Houston, A Rush For Generators Word spread quickly in Houston that Home Depot was open for business Sunday. The parking lot was a hub of activity, as most people gathered for one thing: a generator. 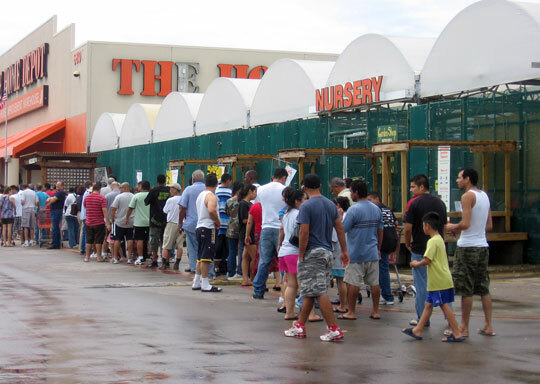 Crowds lined up at The Home Depot in Houston on Sunday, a day after Hurricane Ike struck the state. Most people were waiting in line for one thing: a generator. Though Hurricane Ike mostly spared Houston, the storm left much of the nation's fourth largest city without power. Residents today attempted to get back on their feet. For those whose homes weren't flooded or damaged, the heat is now enemy No. 1, and many people were looking for ways to alleviate it. Word spread quickly in Houston that Home Depot was open for business Sunday. The parking lot was a hub of activity, as a long line wrapped around the building. 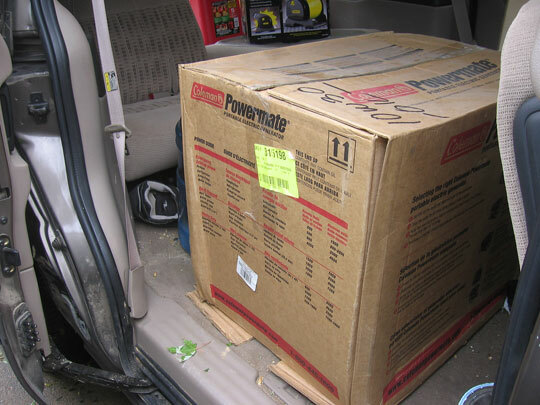 Most people were there for one thing: a generator. Carla Murchison and her family didn't have to evacuate their home, but they did lose power. She got in line at 8:15 a.m. and waited nearly two hours before she could go in the store. "But it was worth the wait," she said, "because now we are going to have air conditioning, light, food and TV." She said her son has the blood condition sickle cell anemia, and needs cool air. Murchison was in the parking lot waiting for her father, Robert Murchison, who strolled out with the new generator, declaring, "This means happiness!" "I can get some rest now," he said. Murchison said he heard on the radio that Home Depot was opening Sunday and didn't waste any time spreading the word, calling his daughter and his neighbor. As residents work to get on their feet, the city still has a lot of work to do. Uprooted trees, large limbs and billboards block driveways and streets; many roads are peppered with glass; power is still out for most residents; and high water makes it difficult to travel in many areas. Houston is under a curfew, between 9 p.m. and 6 a.m., to keep people off the streets.